I was recently interviewed by Angie’s List to talk about pollinator gardens. You can read the article in their recent magazine (page 10) or you can read the full interview here. What are the benefits of starting a pollinator garden and why should people do so? Whether you are avid gardener or just want to be mindful of the environment, there are many benefits to starting a pollinator garden. Pollinators are species of bees, beetles, moths, butterflies, and bats. By planting specific flowering plants, you can attract more of them to your garden. If you are a vegetable gardener, this will help increase the yields of your crops. All those tomato plants need pollinated to produce fruit, otherwise, you’ll just have flowers on your plants with no tomatoes. And if you are designing your landscape, you may simply want to attract pollinators for the pleasure of watching them—like hummingbirds and butterflies. In urban areas in particular, natural habitats change when native landscape is replaced with development. By planting pollinator friendly plants, you add food and shelter back into the environment that may have been lost. When urban landscapes are planted with a diverse selection of plants, they become beneficial for pollinators because they offer a more continuous flow of nectar vs. large areas planted with a single crop that all bloom at the same time. Large areas planted with a single crop are called monocrops. Not only do monocrops bloom at the same time, if the crop is sprayed with herbicides to manage weeds, then pollinators lack choices of food and will feed on areas that may be detrimental to their health. Supporting these species is important for the overall health of our ecosystem. The relationship between plants and pollinators is very intricate, as they rely on each other for survival. Plants need pollinated to produce fruits and seeds, and pollinators need plants for food and shelter. Seventy percent of the worlds flowering plants rely on pollination. Without pollination, human food sources would be impacted. Selecting the right plants is important if you want to attract pollinators. If you select the right plants, pollinators will naturally come to your garden, and eliminate the need for artificial attractants such as hummingbird feeders. Another important component that many people forget is a water source, like a bird bath or water fountain. Pollinators need water and can be negatively affected by not having enough water available, especially during seasons of drought. Some of my favorite plants in my pollinator garden is Red Yucca, which is wonderful at attracting hummingbirds, as well as Lavender, Butterfly Weed, Catmint, Penstemon, Echinacea, Indian Blanket, Blue Mist Spirea, Rabbitbrush, Mexican Sage, and Daisies. 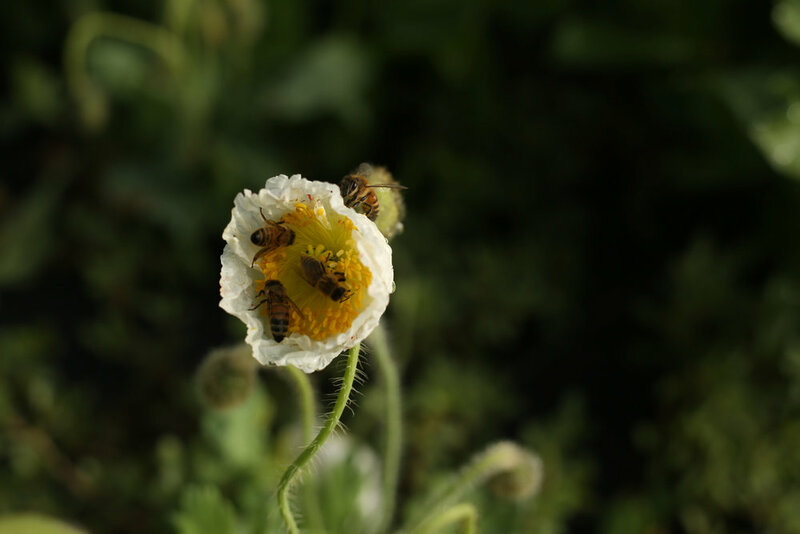 I also notice that honeybees go crazy for the poppies on our flower farm, so if you enjoy specialty flowers you may consider planting a patch of poppies for a special treat in the spring. Many of the plants I mention above do not need a lot of water. They are used to dry conditions, so when people overwater, they can rot the roots and kill the plant. That is the mistake I made with my first pollinator garden. When the plants are first planted, they may need watered 2-3 times a week. However, after they are established, the watering schedule should be adjusted to one deep watering every 7-10 days. What are your go-to resources for choosing the right flowers for your region? And the right combination/rotation of flowers? Are there certain flowers people shouldn’t plant? Such as hybrids or pollinator seed mixes? Just like buying food, I look for organic seeds whenever possible and plants that are native to my climate. Ask your local nursery for native plants, look for reputable plant nurseries, seed companies, and plant breeders. Do you have any advice for people with a little bee-phobia or pollen allergies? For anyone who is nervous around bees, know that pollinators are looking for food sources that smell sweet. Honeybees most likely are not the main culprit at your picnic, as they do not eat protein sources like the typical picnic food such as hotdogs and hamburgers. Furthermore, after a bee stings, it dies, so it does not want to sting you unless it feels threatened. If there is a bee around you, the best thing to do is move slowly and gently wave the bee away if its distracting you. Also, holding a sense of gratitude always goes a long way in keeping fears in check. 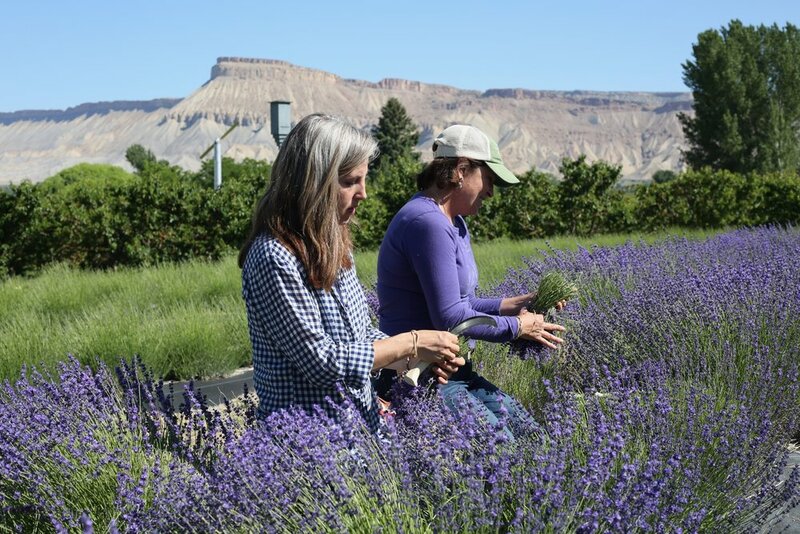 Operating a lavender and flower farm has taught me how to live collaboratively with bees. For example, one of the signs that lavender is ready to harvest is high bee activity. When the oil content in the bud reaches its highest point, the bees come in mass. This means there are a lot of bees buzzing around the lavender when we are hand harvesting which can be tricky. When harvesting lavender, I first remind myself to remain calm and I slowly wave the bees onto the next plant. The only time I’ve been stung is when I accidentally grabbed a bee while gathering a lavender bunch to cut. When this happens, I use a remedy that I learned from Paola from Sage Creations. Any guesses on what it is? Lavender essential oil of course! Lavender essential oil helps to naturally relieve bee stings. I use either straight essential oil, or I make a concoction of Vics Rub and lavender essential oil. It works like a charm (Thanks Paola!). Wasps (such as yellowjackets and hornets) on the other hand do eat protein sources, and are the main culprit at your picnic table. Wasps are not bees. There are hundreds of this species, and some are enemies while others are pollinators. Personally, I am not a fan of wasps in my backyard as there are often children running around, and wasps can be unfriendly. Putting a wasp trap out early in the spring with a little protein juice (say from your hamburger), will attract and kill queen wasps which significantly reduces wasp activity in your yard. I’d love to talk a little bit about the pollinators themselves. Do you have any favorites with particular benefits? Even just the benefit, for example, of butterflies adding beauty and joy to your landscape? And are there any particular species that we should be aiming to draw for the sake of their populations? As a beekeeper, I love the honeybee and encourage the growth of backyard beekeepers that raise bees on a much smaller scale. Honeybee populations have suffered over the last decade and there is much debate on the causes, which range from extensive use of herbicides on agricultural areas, to the process and care of raising queen bees, to colony collapse disorder. Several documentaries have been made on the state of the bees if you are interested in learning more: More Than Honey, Vanishing of the Bees, and Queen of the Sunto name a few. The Monarch Butterfly population is also in trouble, as their population has declined 90% in the last 20 years. The National Wildlife Federation has encouraged mayors to promote monarch butterfly conservation by taking a Monarch Pledge. This pledge requires them to complete actions in their cities to help monarch populations that stretch across the continent from Canada to Mexico. Arvada is one of three cities in Colorado to participate. There are different kinds of milkweed plants that you could plant to give monarch butterflies a food source. Native milkweed plants are typically not as attractive in a home garden, but Butterfly Weed is a more attractive plant with orange flowers that is a nice addition to home gardens. Consider planting Butterfly Weed in mass, making it easy for Monarch Butterflies to find. Monarch Butterflies migrate annually from California to Mexico, so depending on where you live in the country, you may or may not be part of their flyover zone. Any solutions for people with very little space for their gardens? Even as small as an apartment window? Even the smallest garden adds to the diversity of food options for pollinators in urban areas. If you only have a small patio, consider planting flowers in pots or garden boxes. Flowers also grow well with herbs and bring beauty to small spaces. Just remember that plants grown in pots or boxes need watered more frequently as they dry out quickly. You could also join a community garden where you rent a plot of land to cultivate. This is where my love of gardening and community grew. If you don’t have one near by, start one by contacting your local city government office. At Rose Roots Community Garden we have a Pollinator Garden at our entrance and invite all members of the community to help care for it and enjoy it. Here is a picture of Jessie and I standing in front of our community pollinator garden. Do you have any care tips or tricks to share for successful maintenance of pollinator gardens? Waiting to trim your pollinator garden back until after the winter gives pollinators food and shelter during a desolate time of year. Will you talk a little bit about the gardens you’re planning right now? With the purchase of our urban farm just outside of Denver in Arvada, we now have three acres of land to design and cultivate. We are designing our farm to accommodate three styles of gardens: Cut Flower Garden, Formal Landscape Garden and a Native Garden. Our Cut Flower Garden will be grown specifically for cut flower production, where the flowers are harvested just before they bloom so they are never pollinated. When a flower is pollinated, it signals to the plant to begin producing seeds for the next year. However, in order for flowers to last a long time in a vase, it is best if they have not been pollinated. But don’t fret, there are always many flowers in the field that are not harvested, which provide pollinators plenty of nectar. Our Formal Landscaped Garden will be designed to include perennial flowers like roses, peonies, hydrangea’s, flowering trees and shrubs, ornamental grasses, herbs and vegetables. These will either be cut or left to fully bloom for enjoyment. We believe landscapes can be both useful and beautiful at the same time. Many of the plants in the formal landscaped garden will be “test” plants, which will be studied to see which ones could be used in production (like their stem length, color, vigor, growth habits, etc. ), while also bringing beauty to our home, and food and shelter for pollinators. This garden will also have a small water feature, giving pollinators a place to drink, while adding charm to our property. We are also keeping a space completely wild, which we are calling our Native Garden. This garden is where we will cultivate native plants of Colorado and will also be the location of our honeybee hives and bat house. This is a space where we will step back and let mother nature take over.